Bring Back Delicious Indian Pudding! Never heard of Indian Pudding? Well, I volunteer to be president of the Bring Back Indian Pudding Fan Club. It dates back to the 1600’s in New England and is a gluten-free, warm, custardy mixture of cornmeal, molasses, sugar, milk, butter and an array of alluring spices—cinnamon, ginger, nutmeg, and allspice. Serve it warm with a scoop of vanilla ice cream on top. It’s to-die-for. What about Thanksgiving? 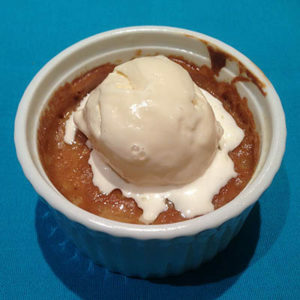 Google “Indian pudding” for recipes. Or use this one by Mark Bittman.